This is Issue 5 of Comics Squee. Each month our podcast panelists, masters of the mystic arts, squee about the comic books, graphic novels, and general sequential art geekery that excites them. I’m your host, Chriss Cornish. Joining me are regular squeesters April Taie and John W Oliver. Taking the revolving 4th chair this issue, is our guest Jesse Butler, of Calico Games, co-creator of the light storytelling game Short Order Heroes, in stores now. This issue of Comics Squee we’ve got: This issue of Comics Squee we’ve got: some love for the scarlet speedster ; steampunk badger Sherlock Holmes ; a comic art magazine ; and a teen jetpack cop saving the 1980s. We rolled two D6 (size-sided dice) to see who goes first and regular squeester John W. Oliver won. Spectrum is an art magazine released once a year. Artists in various industries, including comic book art and action figure modeling, submit their published/released art. The winning pictures and sculptures are printed in the magazine. John uses the book as a writing prompt. He’ll flip through the magazine, looking at the art until a photo or illustration grabs him. 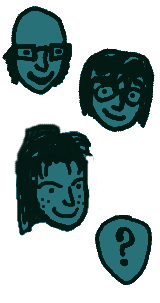 There’s a great range of art and variety of styles. Much of it is comic book cover art, but there’s just as much fantasy and sci-fi illustrations and sculptures. Jesse’s favorite comic book character is The Flash. Specifically Bart Allen as The Flash. Bart Allen was the son of Barry Allen and took up the mantle of The Flash after that character’s death (before it was retconned). 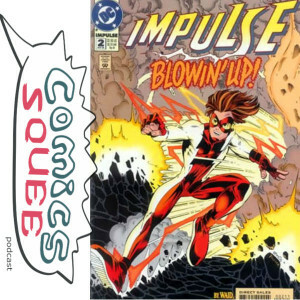 Bart Allen was quick kid Impulse before becoming Kid Flash and then finally The Flash. Until DC decided he wasn’t. We talked about how DC uses Flash the way Marvel used the Scarlet Witch; as the excuse and means of universe resets. Like Crises. And Identity Crises. And Final Crises. And Crises on Infinity Earths. We look forward to DC’s Revenge of the Final Ultimate Super Crises. The Flash is Jesse’s favorite character because the villains are silly. Comics are supposed to be fun, after all. Bart Allen is his favorite Flash because Bart feels like ‘his Flash’; the one he read through their whole character arc and saw grow as a character. 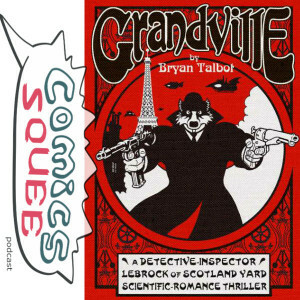 Grandeville: A Detective-Inspector Lebrock of Scotland yard Scientific-Romance Thriller is an alternate history, steampunky adventure with animal people. It’s a great ‘popcorn comic’, action packed and fun. It’s set in a world where France won the Napoleonic Wars and Britain is a backwater full of rebels that recently won its independence. There are humans, but they’re a servicing class and are considered a mutant hairless variety of chimpanzee. There are a lot of tongue-in-check pokes at classic British literature; there’s a Wind in the Willows moment with a character who’s a rat and one who’s a mole, a west highland white terrier named Snowey who has a fever dream about being on the moon with the doughface (Tin Tin). Talbot apparently got the name Grandeville from a late Victorian era French artist named JJ Grandeville who was famous for his funny animal pictures; a turtle and crab dueling, etc. Bryan Talbot has a history of creating very different and acclaimed graphic novels and comics; The Adventures of Luther Arkwright and One Bad Rat. This is a comic Chriss supported on Kickstarter. It’s about a teenage, jetpack wearing cop from the high tech future of 2013 who goes back in time to 1986 to save the future. We’d like to thank Reader and Montclare for giving us the flying cars we were promised here in the future. Of course, our jetpack wearing heroine has gone back in time to keep us from having them in the first place. 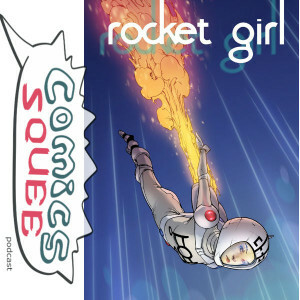 Rocket Girl is fun and clever. It’s great to have an all-ages science fiction comic staring a girl. #1 came out October from Image Comics. #2 came out November. #3 is out this month, December. Check it out. Tell a friend. We took a break to thank our media hosting sponsor, Greta C.
Our mini-squee is from comics fan Tina Lo Sasa who came to comics late and is loving the Fringe TV show tie-in comic. 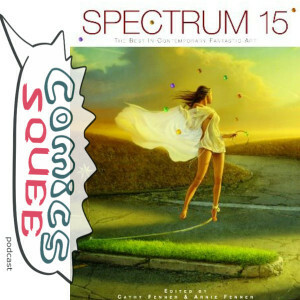 This mini-squee was recorded at Read Comics in Public Day 2013. Question Time: Who is Your Favorite B-List Superhero? Chriss: Plastic Man, DC Comics. He’s rooted in the loony tunes, crazy early tradition of comics. Plastic Man is fun and interesting and has the best reason of all superheros for his silly outfit. Jesse: Booster Gold, DC Comics. He started as a silly character and got an arc where he went from egotist to actiony time cop. April: The Tick. He’s clueless and endearingly silly. While in the TV series The Tick is A-list in The City, in the original comics he was B-list (A-list in his world were a Superman analogue and Sam the Samurai). John: Blue Devil, DC Comics. As a kid John really enjoyed the idea of a stuntman who got his costume stuck to him and went out to fight crime. The current Blue Devil, however, is an actual devil – which is just boring. Jesse: Our guest is looking forward to seeing his game, Short Order Heroes, in game stores. And, of course, the classic missing Doctor Who episodes discovered this year at a relay station in Ethiopia. John: Regular squeester John W. Oliver is looking forward to Locke & Key: Alpha and Omega to be released as a trade. This is the finale to Joe Hill’s acclaimed horror novel run. It’s great that IDW allowed Joe to tell a complete story with a definite ending. April: Regular squeester April Taie is excited for We Can Fix It, one of the many titles she got in Top Shelf’s big Fall sale this year. Chriss: Our host Chriss Cornish is looking forward to finishing the volume of Supernatural Law she’s currently reading. The part she just reached is a Jack Benny tribute and it features a clutz suing his guardian angel for negligence. The arching storyline of this graphic novel features the series’ Swamp Thing analog (Sod, The Thing Called It).